Modern graphic design is about more than just making a logo. Today, the graphic design industry encompasses different disciplines across both print and digital platforms. By taking this course you will enhance your knowledge of core graphic design principles and learn how to apply these concepts to your designs. 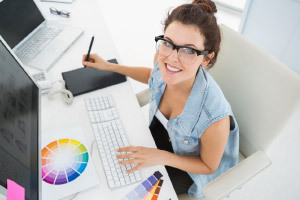 This will give your career in graphic design a real boost, and open up a wider range of lucrative opportunities for you. The perfect design can make the difference between a company’s success or its failure. Choosing different logos, colors, and even fonts will directly affect customers’ decisions to buy or not to buy. This makes graphic designers highly valuable to the world’s most successful companies. In order to become a valued graphic designer, first you have to learn basic graphic design principles and study some of the most successful designs from recent years. This course will help you do just that. This course is designed for graphic designers starting their career and existing graphic designers who are looking to refresh their knowledge. The course will guide you through core design concepts, starting with composition and balance. You will then learn about the importance of contrast and hierarchy, and will be shown how to apply these principles in a practical manner. Next, the course will discuss how to apply the concepts of color, shapes, tones, and points in your design. Considering the constantly changing nature of graphic design, taking this course is a great way to discover core principles that work in almost every design assignment, whether it’s making a logo or a typography. By the end of the course, you will have confidence in your understanding of specific graphic design concepts, and you will be able to apply these lessons to your designs. So get started, and expand your graphic design skills today! After completing this course you will gain a good knowledge of some of the most important design principles and learn how colour, shape, tones, points and texts are used differently in reflection of the context that is being portrayed. You will understand the factors that need to be considered when producing and evaluating a product during the design process.